The Atlantic overturning is one of Earth's most important heat transport systems, pumping warm water northwards and cold water southwards. Also known as the Gulf Stream system, it is responsible for the mild climate in northwestern Europe. Scientists now found evidence for a slowdown of the overturning—multiple lines of observation suggest that in recent decades, the current system has been weaker than ever before in the last century, or even in the last millennium. The gradual but accelerating melting of the Greenland ice-sheet, caused by man-made global warming, is a possible major contributor to the slowdown. Further weakening could impact marine ecosystems and sea level as well as weather systems in the US and Europe. "It is conspicuous that one specific area in the North Atlantic has been cooling in the past hundred years while the rest of the world heats up," says Stefan Rahmstorf of the Potsdam Institute for Climate Impact Research, lead author of the study to be published in Nature Climate Change. Previous research had already indicated that a slowdown of the so-called Atlantic meridional overturning circulation might be to blame for this. "Now we have detected strong evidence that the global conveyor has indeed been weakening in the past hundred years, particularly since 1970," says Rahmstorf. Because long-term direct ocean current measurements are lacking, the scientists mainly used sea-surface and atmospheric temperature data to derive information about the ocean currents, exploiting the fact that ocean currents are the leading cause of temperature variations in the subpolar north Atlantic. From so-called proxy data - gathered from ice-cores, tree-rings, coral, and ocean and lake sediments - temperatures can be reconstructed for more than a millennium back in time. The recent changes found by the team are unprecedented since the year 900 AD, strongly suggesting they are caused by man-made global warming. "The melting Greenland ice sheet is likely disturbing the circulation"
The Atlantic overturning is driven by differences in the density of the ocean water. From the south, the warm and hence lighter water flows northwards, where the cold and thus heavier water sinks to deeper ocean layers and flows southwards. "Now freshwater coming off the melting Greenland ice sheet is likely disturbing the circulation," says Jason Box of the Geological Survey of Denmark and Greenland. The freshwater is diluting the ocean water. Less saline water is less dense and has therefore less tendency to sink into the deep. "So the human-caused mass loss of the Greenland ice sheet appears to be slowing down the Atlantic overturning - and this effect might increase if temperatures are allowed to rise further," explains Box. The observed cooling in the North Atlantic, just south of Greenland, is stronger than what most computer simulations of the climate have predicted so far. "Common climate models are underestimating the change we're facing, either because the Atlantic overturning is too stable in the models or because they don't properly account for Greenland ice sheet melt, or both," says Michael Mann of Pennsylvania State University in the US. "That is another example where observations suggest that climate model predictions are in some respects still overly conservative when it comes to the pace at which certain aspects of climate change are proceeding." 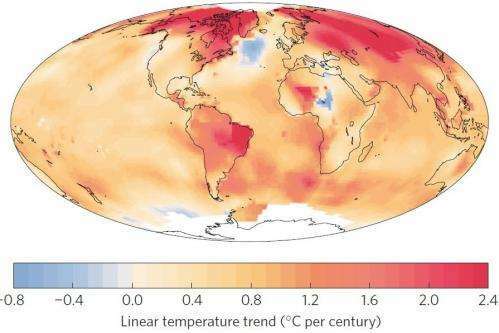 The cooling above the Northern Atlantic would only slightly reduce the continued warming of the continents. The scientists certainly do not expect a new ice age, thus the imagery of the ten-year-old Hollywood blockbuster 'The Day After Tomorrow' is far from reality. However, it is well established that a large, even gradual change in Atlantic ocean circulation could have major negative effects. "If the slowdown of the Atlantic overturning continues, the impacts might be substantial," says Rahmstorf. "Disturbing the circulation will likely have a negative effect on the ocean ecosystem, and thereby fisheries and the associated livelihoods of many people in coastal areas. A slowdown also adds to the regional sea-level rise affecting cities like New York and Boston. Finally, temperature changes in that region can also influence weather systems on both sides of the Atlantic, in North America as well as Europe." If the circulation weakens too much it can even break down completely - the Atlantic overturning has for long been considered a possible tipping element in the Earth System. This would mean a relatively rapid and hard-to-reverse change. The latest report by the Intergovernmental Panel on Climate Change (IPCC) estimates there to be an up to one-in-ten chance that this could happen as early as within this century. However, expert surveys indicate that many researchers assess the risk to be higher. The study now published by the international team of researchers around Rahmstorf provides information on which to base a new and better risk assessment. Only if it slows. If it flips (i.e cold north Atlantic water flowing south), we have a whole different ball game on our hands. The Sun's magnetic influence is still the main cause. If true it looks to be a self regulating negative feedback loop to me. Melting glaciers equal more fresh water equals colder weather equals less melting and fresh water. Son of a gun I just found this. 1958 warming and cooling both at the same time. All of this utter hysteria based on an unproven theory. Are we to believe that man will cull his own herd by about 75% to "save" the planet? I seriously doubt it. In the end we will learn to live with the climate we are given, the taxes and regulation are politics, money, and power. Salt. All the salt they throw on the roads around here that dissolves vehicles in 2-5 years has to be instead dumped into the water south of Greenland. Problem solved. As for an uproven theory - AGW is actually science - and the science keeps getting more complete. Temps are going up, ice sheets are melting, glaciers are melting, oceans are warming, and rising - all understood to be related to the warming climate. How would you know? You don't even believe in global warming, but only regional climate variaions. Want proof? Fine. Do you accept the standard definition for global warming? ...no? Then you don't believe in global warming. Past tests indicated primary driver is the amount of salt in the ocean. Past slowdown was caused by the sudden loss of fresh water stored in a large Ice damn mid-west US about 10,000 years ago. Without the gulf stream, Europe freezes over. America becomes snow covered most of the year. Food shortages will occur. People will being moving around. The place to be will be near the tropics. Near the tropic of cancer in Africa. Near the tropic of Capricorn south America. Probably on the cold side. The tip of Florida might do but not enough land area there. Mexico might have some room but there will be lots of people moving. AGW is a theory which has not been validated. Current temperature data doesn't support it. The gulf stream has shut down in the past and it will happen again. Strange thing about it is that the earth warms up but the areas outside the tropics are a lot colder. AGW is a theory which has not been validated. Current temperature data doesn't support it. Why do you think that temperature data doesn't support AGW? It supports it very well. Do you have any evidence to the contrary? Strange thing about it is that the earth warms up but the areas outside the tropics are a lot colder. Actually, the greatest warming is seen in the polar regions. This was actually a prediction that climate science made about AGW well over 100 years ago. these GW trolls deniers are working for oil companies and their PR agencies. They pollute and comments articles with whatever idiocies they can come up with for a few $. Thanks a lot for arguying with them, they are so ridiculously stupid! Since u refer to Sol's electromagnetic field (EMF) THEN u must see temperatures modulated on 11yr cycle ie either up/down, where is the data ? Any 11 yr cycle there anywhere ? in any part of the atmosphere ? U have NEVER presented anything EVER supporting your claim, electrodynamics physics also does NOT support your claim. U have to realise Sol is so VERY far away (1/d^2), Earth's EMF being FAR closer & local overwhelms immensely Sols. ie NOTHING at all of Sol's field reaches anything able to affect climate & Sol's field is so low its unmeasurable on Earth or atmosphere ! Also, when u can get a grip on specific heat you can understand WHY this is significant ! Do not kidd yourself, "they" (our mil and ?) have been and are controlling the weather - as is Russia and China - they are now ready to brig this out in the open and "ask for permission," although "asking for forgiveness" as it has been done-to-date for our "best interests" is more like it---See the 2015 Report by the National Research Center and "read between the lines..." Those many "so-called wacko reports" of spraying in the skies--"Persistent Jet Controls" are the SAAMs (the new name) as is described in the report on "ALBEDO MODIFICATION"--which is now being proposed as emissions restriction is failing. Last fall the dialogue moved from Climate Change to Climate CRISIS---the "SOLUTION" is ALBEDO MOD using SAAM (Stratospheric Atmospheric Aerosol Management.) When you understand what HAS been going on---the "recent-to-current debate" begins to take on ore significance - Arctic Ice Melting---"WHO WANTS TO EXPLORE FOR OIL THERE--?" Keep Digging - much there! The study above directly refutes the findings of Rhamstorf & Mann et al, and other studies making this faux claim. This article is based on the premise stated in the Rhamstorf et al study abstract is the take-away, "Here we present multiple lines of evidence suggesting that this cooling may be due to...We discuss a possible contribution of the melting of the Greenland Ice Sheet to the slowdown. Using a multi-proxy temperature reconstruction for the AMOC index suggests that the AMOC weakness after 1975 is an unprecedented event in the past millennium (p > 0.99)." "...the combined contribution of the ice sheets is 0.60 [0.42 to 0.78] mm yr–1. Yea, that's 0.6mm per year: ~1 foot in over 500 years. Yes the Rossby 2014 paper is at odds. "Despite apparent disagreement between recent studies on the ability of data to detect weakening in the GS flow, estimated transport changes from 3 different independent data sources agree quite well with each other on the extreme decline in transport in 2009–2010.". I also note that the above goes back to 900AD and not just 20 yrs as Rossby '14 does. Further to my post just prior. here is a link to the full paper. 2. What Rossby is measuring is largely associated with the wind-driven boundary current of the subtropical horizontal ocean gyre, the warm poleward current that hugs the coastline of the southeastern U.S., the current that *physical oceanographers* refer to as the "Gulf Stream". This is rather different from what we are looking at, which is what oceanographers instead refer to as the "AMOC" and more specifically, the "thermohaline circulation" (sometimes also called the "conveyor belt" because of the shape of the circulation cell, which in the Atlantic carries warm waters northward near the surface and cold waters southward at depth, thus providing a net transport of heat poleward). That vertical overturning circulation is driven instead by lateral density contrasts that arise due to variations in temperature and salinity. 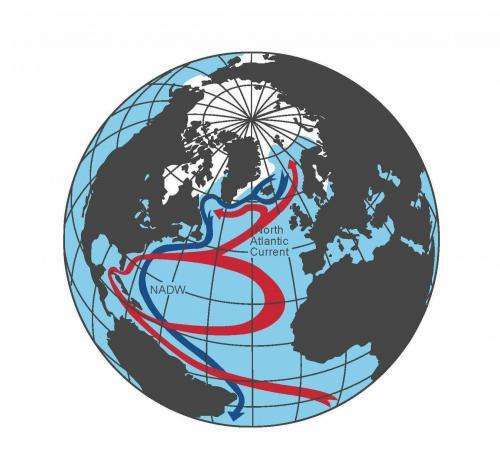 The shallow component of this ocean circulation pattern does not recirculate within the subtropical gyre and instead continues northward across the ..
North Atlantic toward Iceland and Europe. That component is typically referred to as the "North Atlantic Drift" by oceanographers. It is not the "Gulf Stream". But the problem: in common parlance (and numerous news articles and reports), it *is* referred to as the "Gulf Stream". So, ya that there study doesn't contradict anything in the new Rahmstorf et al study. Which is pretty much the common theme for denierville - make up something, hope no one notices. Aw heck, you know that I don't. These are the primary impacts of global change. Read above for what I've been saying. Told us what precisely ? Your so called 'sayings' are so off the money, its not even funny any more its tragic ! Y is your writing NOT commensurate with claiming "4 technical degrees" as u do ? Ya know Mike, while I won't read the garbage that Greg Tyler posts under his Water Pfftt persona, I have noticed that his facebook page shows that a total of 10 people the world over have joined. That, in and of itself, is a testament to how obscure and meaningless his little diatribes and clear lack of understanding is. I personally think that the more people respond to his garbage, the more he likes it. Good or bad doesn't matter, what matters is being mentioned. It's the old "any publicity is better than none" adage. He will never answer your questions Mike. He has never, not once, not one single time, ever, provided any quantifiable evidence to support his stupid "theory". Never. Not once. He will never answer your questions Mike, because he can't. He doesn't understand hydrodynamics, nor fluid dynamics, nor lapse rate, nor anything else beyond what one could get from a highschool physics course. You've proven it already bud, you don't have to keep doing it over and over.